Best Bells On The Market! How sure are we that Russian Kettlebell - 14kg (31 lbs.) will work for you? Simply fill out the form below and put Russian Kettlebell - 14kg (31 lbs.) to work for you right now. Obviously, we would go out of business if Russian Kettlebell - 14kg (31 lbs.) didn't work, the way we said, right? 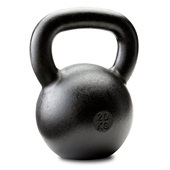 With the promise of a full refund if you're unsatisfied, you have nothing to lose by trying Russian Kettlebell - 14kg (31 lbs.). Go ahead and try it today. 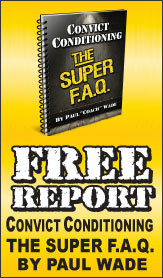 Want to Combine Awesome Cardio And Explosive Power—For A Leaner, Sexier, More Dynamic Body? Then The 31 lbs RKC Kettlebell Is Just Your Ticket! Dragon Door was the first in the US to design a 31 lbs cast iron kettlebell—uniquely suited to women's needs. While most fit women will start with Dragon Door's specially designed 18 lb kettlebell, the 31 lbs kettlebell has quickly become the tool of choice for women who want to quickly accelerate the shape-changing power of Russian kettlebells. Women, to make sure you take full advantage of your 31 lbs kettlebell, get Andrea Du Cane’s The Ageless Body book and The Kettlebell Boomer DVD. Rated 10/10 Best Bells On The Market! Don't waste your money on subpar kettlebells, buy the best kettlebell from Dragon Door. I purchased a 14 kg bell, because I am moving to a new town and don't want to lose the skills I've built. I could have purchased a bell that was not as costly, but they are no where near the quality of the Dragon Door. This kettlebell will be around and in good condition for a very long time! I love my Dragon Door Kettlebells. Once you use a Dragon Door bell, others are just disappointing. Received both of my 14kg kettlebells to our APO address. Thank you for shipping to service members overseas at an affordable rate and for taking the time to fully secure each box with packing tape. Both boxes arrived fully intact and the kettlebells were in perfect condition. 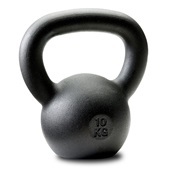 These are the best kettlebells in the market and a great investment. They will last forever! The only negative to this fantastic kettlebell is that I do not want to use the other non-dragondoor kettlebells I own anymore. Why? It feels so good in my hand. It even looks like quality. This kettlebell spoils you. It is not cheap but is a great value. For example, I have other kettlebells that are painted that chip and may slip after the hand sweats. In short, I wondered why would I pay more to get a kettlebell? Now I know the answer, they are great compared to other kettlebells I own. Rated 10/10 The only kettlebells I use in my facility! RKC Kettlebells are the highest quality kettlebells on the market. Less expensive kettlebells will not withstand heavy use over time and don't feel as comfortable in the hand. Clients often comment on the noticeable difference between the RKC kettlebells and ones they're using at home. Worth every penny spent! Rated 10/10 It's a Dragon Door - of course, its a 10! Dragon door bells offer the best value out there. Also, they are super responsive via email and on the phone, always updating me as to order status. I've received 2 of 3 bells so far that I've ordered and am nothing but impressed with the product. great bell (nobody makes a better product), ok price (should be cheaper since its made in China), shipping cost way to high (why not send it flat rate US Mail for half the price)????? Getting started with kettlebells was one of the best things I've ever done.